Hobo Sailor: Fire in the boat!! We left Guana Cay today. 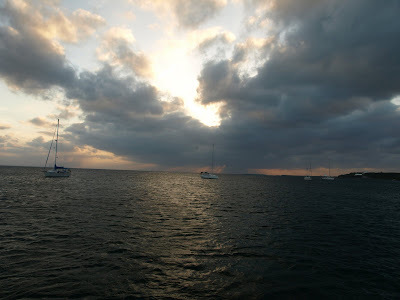 Our goal was Green Turtle Cay but the weather was great so we just kept on sailing. We made for Great Sail Cay, which was our first stop when we arrived in the Bahamas. Appropriately, it will be the last. We were flying along. The wind was perfect, blowing just hard enough to move us along at a good clip, but no so hard that it would create rough conditions. We have been averaging between 4.5 and 6 knots all day. Taking the wind on the aft quarter. Boat almost level. Hardy any waves. Beautiful conditions. The sun was starting to go down, so I lit up some charcoal to grill a steak. I then filled up the alcohol wicks to our Origo stove which ran out of fuel a few days ago. Our Friends Lee and Trey were up ahead of us. There boat is much faster than ours due to their longer waterline. They were sailing with their jib only, and I thought if I put up our mizzen stay sail that we might be able to catch them. I started working on setting up the sail. It’s not the easiest sail to use. Before I had the sail set up just right, LeeAnn asked me if I could come down below, "I'm kind of busy" I said, "is it important?" She replied "the boat is on fire..."
I immediately dropped what I was doing and went below. The Origo stove was a blazing inferno. I opened up the lid to the stove and saw that one of the wicks had a huge flame that was burning out of control. With the lid open, the second wick ignited. Great more fire! I grabbed a pizza pan and placed it over the wick that was producing the largest flame. I was hoping it would smother the fire out. It didn't. But it did reduce the flames somewhat though, so I left the pan in place. I tried using a towel to smother out the flames from the other wick. It worked! So I removed the pizza pan and tried to use the tool to smother out the larger fire. No luck. The towel just soaked up burning denatured alcohol that had overflowed out of the wick. So now I’m holding a fireball, standing next to a alcohol stove that is burning out of control. in addition to the burning stovetop. I turned, bumped into LeeAnn, and then rushed for the hatch and then threw the burning towel overboard. For a split second I saw the towel get caught in the belly of our big mizzen staysail that I had only raised half way. I paused for a moment, imagining the whole sail going up in flames, and considered which fire would be the greatest danger. I decided the fire inside the boat was the bigger priority and I ducked back inside to figure out how to extinguish it. I noticed LeeAnn sitting on the bed holding a hand to her head. Apparently when I crashed into her the towel smacked her head and burnt off a bit of hair, and most of her eyelashes on the right side! Maybe water? Or hadn’t I heard somewhere that water will only spread an alcohol fire? “Where the f*ck is the baking soda!" I chance a glance and see her examining the damage with a small mirror. The flames go down, but not out. I burn my fingers closing the hot lid to the stove. It smothered out the rest of the fire. LeeAnn is still on the bed with the mirror inspecting her eyelashes. She seems okay so I turn my attention to the food that had been cooking before the stove caught on fire: Garlic and herb rice, steamed veggies, everything looks okay! Except for the steak I’d put on the grill! I rushed outside to find it a little over done, but still edible. We dish up some sides, and go sit outside to eat. Right on time to watch the sun go down. Just chalk it up to another day in the life of living on a boat. *Fire analysis: My theory is that I overfilled the canisters. They were okay to use when semi-level, but when I hauled up the mizzen stay sail the boat healed over further, causing flaming alcohol to spill out.